Laziness was my middle name last Thursday, but there was no way that I was going to pass up on this event. I’ve been waiting a couple of years for this to transpire in good old Toronto. So, when I heard that Fashion’s Night Out was finally going to take place in the T.Dot, I was beyond excited. See, I have experienced FNO in New York City during their first couple of years on the scene as they geared up for their glamourous soiree of musical mayhem and fashionista fabulousness. I attended fabulous parties in SOHO, caught dinner at stylish spots, canoodled with folks in the beauty and fashion blogging world, was able to hang with my girl Afrobella, and had a grand old time networking and revelling in the world of beauty and fashion. And here I am, a few years later in a city that has a marvellous fashionable heartbeat of its own – Toronto. There is absolutely no way I will even compare how the two add up against each other, that just wouldn’t be fair. 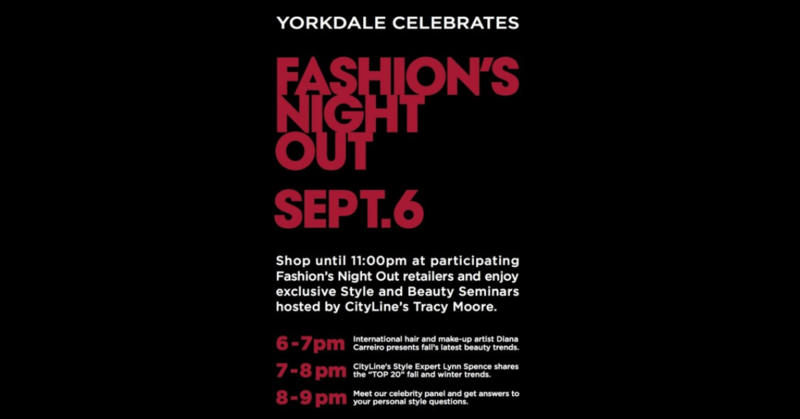 But I am going to share a few comments about my Fashion’s Night Out Yorkdale experience on the whole. I did want to partake in the festivities and head down to Yorkville where all the goodness was happening. I desperately wanted to attend The Rac Boutique Bazaar along with other spots that were buzzing, according to my Twitter timeline. Especially with the Toronto International Film Festival taking place, everyone was out and about on the town. However, I was thoroughly exhausted and thought, “Why not catch some of the happenings over at Yorkdale Mall?” It is one of our high-end fashion malls here and it happens to be literally a few doors down from my comfy abode. How can I say no? As I reached, I was immediately surprised to hear and see a DJ booth set up right in front of Topshop & The Bay, blaring music for patrons to enjoy. Off to a good start, I thought. The only thing was, there were only about 38 out of over 200 stores that actually took part in the event. And that would have been alright if only the stores listed actually took part. Out of all the stores that were listed on the above flyer, I decided to make stops at a few of my favourite haunts: Tory Burch, Michael Kors, The Bay and Holt Renfrew. I would have to say the best spot award would have to go to Tory Burch. You were greeted with refreshments, spirited salespeople, and these unbelievable cookies! I am still having trouble eating mine – I think it’s so adorable! At Michael Kors, there was absolutely nothing going on – no balloons, no music, no specials that I was presented with – nada. The saleswoman who served me was asking me what was transpiring in the mall regarding FNO on the whole. I would have rather preferred her being excited about what was going on in her store. Through conversation, I did make a friend though and will be sure to visit her in the future. The Bay had thumping music, hors d’oeuvres and dancing salespeople on the main floor, upon entrance. Not too shabby at all, but something was missing. And I just couldn’t put my finger on it. I think my biggest disappointment was at Holt Renfrew. The large high-end retail store is celebrating their 175th anniversary and they did so with a large street party at their main downtown location. That is not surprising at all. But it would have been nice if a little bit of that downtown fever – handing out tees and magenta popcorn, limited edition Cokes (which stayed on the shelf) and the like – was apparent at this store. It was totally null and void at Yorkdale Mall and for a fashion mega-staple like Holts, I actually wanted to see and feel more of a presence. They do have fabulous limited edition magenta (Holt’s signature colour) items available from designers across the board. Of course, this Michael Kors tote is on my wish list. All in all, it simply felt like the stores just stayed open for the sake of staying open. The jubilant party atmosphere was nowhere to be seen or felt. At the nail salon in my area on Friday, I asked a Burberry-toting fashionista if she took part in the FNO festivities and she answered – “That’s why Yorkdale was open until 11!” Not exactly what I was expecting to hear. I’m thinking a little more preparation and a bit more marketing may help in that area. In this day and age where everything is about how social media assists in your marketing platform, there wasn’t even a Facebook/Tumblr/Pinterest – whatever- page available for fans. Only a twitter account (if there were pages, I certainly didn’t find them). I found out about the event because I’m a crazy newspaper and blog reader. Was it too last minute? Too rushed and not thoroughly thought through? Let’s keep in mind, this is Toronto’s first FNO and there is always room for improvement. You can only go up from here and constructive criticism can be used as ammunition for the next round. Let’s just say, next year if I’m not celebrating in New York City like I would like to be, then I will be heading downtown to take in the festivities. But I will also be rooting for Yorkdale Mall to step it all up a notch and hold out the torch for being the fashion center that it is known to be. For other write-ups about FNO Toronto, check out The Kit, Toronto Life and Style Democracy for their takes on the happenings of Toronto’s first foray into FNO territory. I hope everyone enjoyed their first FNO experience!